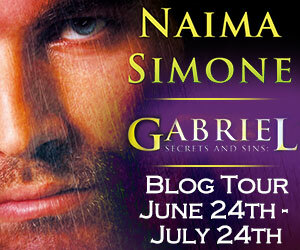 The Secret’s out and it’d be a Sin to miss Gabriel’s tour! Join Naima Simone on a tour to remember that’s Boston Strong! With Guest Posts, top ten lists and a Boston Strong T-shirt giveaway along with an Amazon gift card, Naima is the author to discover for romantic suspense lovers everywhere! I posted the following review on Amazon, Goodreads and B&N. It was a great story! ~I received a free copy in exchange for my honest review, so here it is. This is one of those stories that is hard to put down. It will take you on an emotional ride and in the end love will win. I am not sure if I would call it a love story with suspense from 20 years of secrets or a suspense story with romance added. Either way I loved it and highly recommend it. This is the first story by Naima Simone that I have read and I will be looking forward to reading more from her.